Aperture Exporter was designed specifically for Aperture users who have decided to move to Lightroom. With only a few options and a click of a button, Aperture Exporter re-generates your Aperture Library as a set of folders and subfolders containing your images. 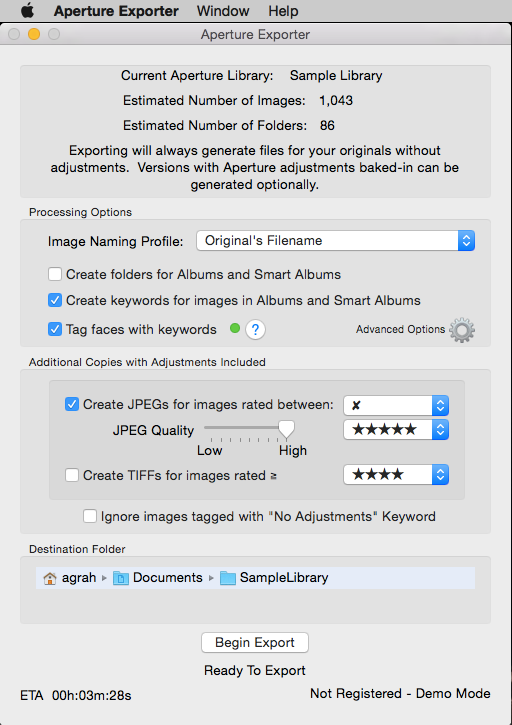 When you first try Aperture Exporter it will be running in demo mode which places restrictions on the number of images that are exported into each folder and the number of faces that will be tagged. To remove these restriction you must purchase a license key. Mac OS X 10.7 or better. A working installation of Aperture 3.x is also required.